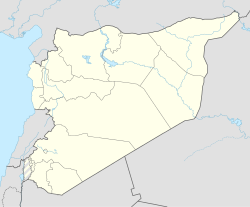 Kafr Batna (Arabic: كفر بطنا‎, also spelled Kfar Batna and Kafar Batna) is a town in the Rif Dimashq Governorate in southern Syria and a suburb of Damascus. It is approximately 4 kilometers (2.5 mi) east of the Bab Sharqi neighborhood. Kafr Batna had a population of 22,535 in 2004. Kafr Batna's name suggests it was previously an Aramaean village during the Iron Age. During a Qaysi revolt against the Abbasid governor of Syria, Qaysi rebels led by Muhammad ibn Bayhas camped out in the town in 842 CE before proceeding to Damascus. There, they attracted the support of other villages in the Ghouta region which aided them in their failed insurrection. Yaqut al-Hamawi visited the town in 1226, during Ayyubid rule, and described it as "a village in the Ghautah of Damascus, in the Iklim (District) of Da'iyyah." He also noted that some members of the Umayyad tribe, which ruled Syria until the mid-8th-century, still lived in Kafr Batna. The Ottoman Empire annexed Syria including Kafr Batna in the early 16th-century and continued to rule until 1918. In the mid-18th-century, a prominent businessman and scholar from Hamah, Abd al-Qadir al-Kaylani, endowed large swathes of farmland property in Kafr Batna in a waqf (religious endowment) to be supervised by his wife al-Sharifa Rahmana. During the Ottoman period, a Sheikh Muhammad ibn Isa al-Qari' endowed a share of his vineyards in the town which was supervised by members of his family. Some of Kafr Batna's inhabitants have participated on the side of the opposition during the 2011-2012 Syrian uprising against the government in Syria. On 29 January 2012, Syrian Army tanks entered the suburb to force out rebels from the opposition Free Syrian Army (FSA) who were positioned there. Although it has not been verified, opposition activists reported that five FSA soldiers and 14 civilians, including at least one minor, were killed during the raid. On 17 March 2018, the Syrian army captured Kafr Batna. ^ a b Siddique, Haroon. Syrian troops battle to retake Damascus suburbs. The Guardian. 2012-02-29. Retrieved on 2012-02-19. ^ a b Forces battle to retake Damascus suburbs. The Daily Star. 2012-01-30. Retrieved on 2012-02-19. ^ "Syrian forces kill dozens in bombardments: opposition". Reuters. 13 January 2013. ^ "Fears for the lives of civilians after the regime forces advanced in the southwestern pocket of the Eastern Ghouta under heavy fire cover". SOHR. 17 March 2018. Retrieved 17 March 2018. Burns, Ross (2005). Damascus: A History. London: Routledge. ISBN 0-415-27105-3. .
Cobb, Paul (2001). White banners: contention in ʻAbbāsid Syria, 750-880. SUNY Press. ISBN 0-7914-4879-7. .
Oriental Ceramic Society (1998). Transactions of the Oriental Ceramic Society. 63. Oriental Ceramic Society. .
Reilly, James A. (2002). A small town in Syria: Ottoman Hama in the eighteenth and nineteenth centuries. P. Lang. ISBN 0-8204-5606-3. El-Zawahreh, Taisir Khalil Muhammad (1995). Religious endowments and social life in the Ottoman province of Damascus in the sixteenth and seventeenth centuries. Publications of the Deanship of Research and Graduate Studies, Mu'tah University. . This page was last edited on 29 March 2018, at 05:04 (UTC).